Exercise bikes are extremely popular these days. They give you a wonderful way to workout and burn calories while keeping impact on your legs and joints very low. There are a variety of different bike types available though, so which is best for you? Well today we’re looking at upright bikes, and spin bikes. My personal choice is a good spin bike, like the Keiser M3i. This is because I’m an athlete and need hard conditioning workouts, which the spin bike provides. Many upright bikes just won’t be able to give an intense enough work out for me. Spin bikes are usually more stable and designed for harder workouts. With that said, if you aren’t at a high level of fitness, an upright bike could be the choice for you. You may also be wondering whether a bike is even for you. If so you can take a look at our breakdown of using a treadmill vs a bike and take your decision from there. It depends on a lot more than just your level of fitness, so take a look through our article and see what recommendation works best for you! 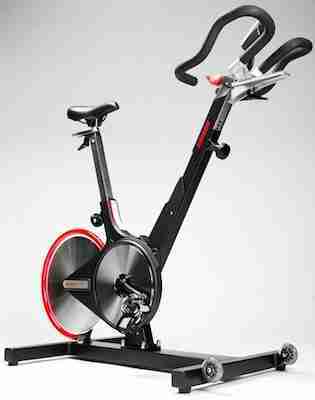 The spin bike, also known as an indoor cycle, has only been available in the mainstream since the 1980’s and 90’s. They are designed to mimic a real road bike, so they have the exact same type of build and appearance, including normal handlebars and a bicycle seat. A hunched over riding position is the way all of these bikes are used, though you can also stand up on them. Resistance is provided from a flywheel which actually attaches to the pedals, so they don’t stop moving just because you do. 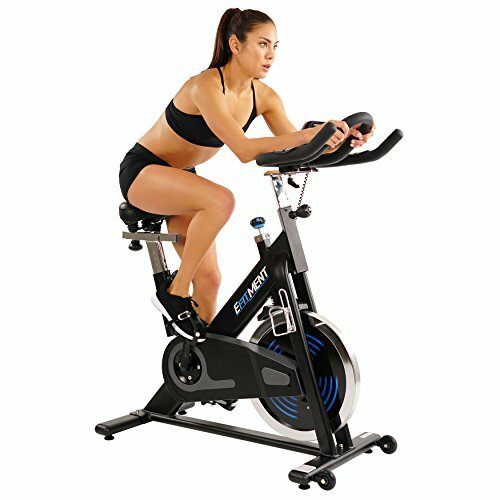 An average spin bike costs more than any other type of exercise bike and is designed for realism. They were originally created for professional cyclists who can’t train outdoors, so the workout potential with them is huge! Along with feeling very real, in every area including gear changing/resistance, these bikes don’t tend to have many extras. 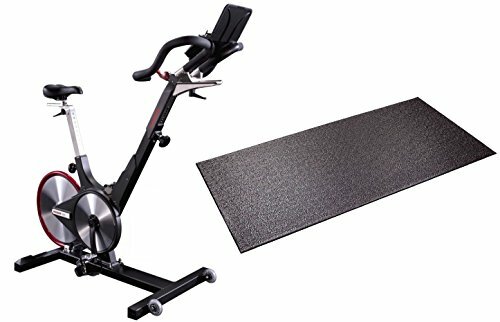 A console/screen is rare, unless you get something like the Efitment Indoor Cycle, with some bikes utilizing video apps to give a workout instead. With the potential of spin workouts and spin classes, these are becoming a lot more popular commercially. A spin bike uses a heavy fly wheel to provide resistance. This creates a similar resistance to a road bike, where the fly wheel is attached to the pedals so the pedals keep moving as long as the wheel does. Because of this you use a lot more energy to control those pedals. With the use of a standing position as well, even more muscles are activated and more energy is used. This means the spin bike is capable of more extreme workouts than any other indoor exercise bike. The similar position and fly wheel set-up also helps with realistic training for outdoor cycling. You use the same muscles in the same positions, and with a good video or app you can even simulate almost any outdoor ride you can think of. Using the resistance in place of gears to simulate different inclines really helps with this feature. The bike itself also looks exactly like a road bike, with the handle bars in the same place and the resistance knob usually located where the gear selectors would be. The standing position is also used on spin bikes, which activates more muscles and allows a much tougher workout. Being able to stand on the bike and exert a lot of force through the pedals means you can push through higher resistance than what’s possible from a sitting position. Having different positions also gives the possibility of using specialized workouts to target weak points or specific muscle groups. Indoor cycles are built to be sturdy and reliable. Simulating a real bike means there can’t be any wobble or instability when the user is leaning in any direction or pedalling really hard. A good spin bike won’t budge at all in either situation. That also helps it to be more realistic because you can really hammer your workout without any risk of falling over or off. Overall reliability of the machine is improved by these features too. Having to survive hard use means spin bikes are built to last many bumps and bangs, and will also hold up fine if misused a little. The Sunny SF-B1002 is an example of a sturdy bike, reliable and capable of intense usage. The sturdiness also lets heavier users take advantage of this equipment. Users who are too heavy for upright bikes are likely to find spin bikes that can and will support them. If you’re a home user, a spin bike could be a pain because it doesn’t fold up and isn’t easy to move out of the way. 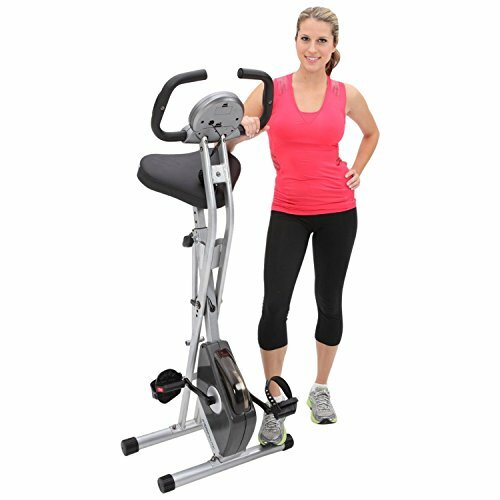 Some have a couple of wheels so they can be tilted and wheeled around quite comfortably, like the Body Xtreme Fitness Exercise Bike. However, because of the size you’re unlikely to fit one into a cupboard or small shed. Instead, a spin bike is designed more to be kept in place as a permanent feature. Less experienced users could struggle a little with a spin bike. There are low resistance settings to use but without programs and readouts on most versions, it’s hard to know what kind of work out you’re actually getting as a beginner. This leads to boredom and disinterest for some users. Other users try to join in using vids or spin classes, which are too difficult for their level of fitness. It is possible to start out with one of these bikes, it just takes a bit of time and patience before you can participate on classes. The lack of pre-programmed workouts is a real problem for novice users who don’t know how to create their own workout. If you’re unsure on what workout to do, a spin bike is probably not for you. They’re a lot more useful for cyclists and people who know how to craft their own workouts so they can hit their own goals. 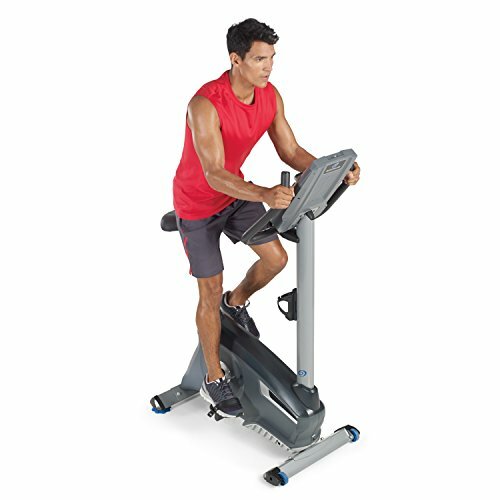 An upright exercise bike is generally the most popular and frequently seen type of exercise bike. They have been around in gyms and homes for decades and are super easy to get started with. They are designed to let you sit completely upright, not hunched over like you would be on a real bike. This is more comfortable for a lot of people, because there’s less strain on the spine. Handlebars are also higher up to accommodate this seating position. They’re conveniently placed right in front of you when in the upright position. Pedals are powered completely by your legs and will stop moving as soon as you do. Take a look at the Marcy Upright Exercise Bike to get a good idea of the design. Training with this type of bike is great for people who prefer an upright position on the seat. It’s also good for general cardio and calorie burn, though it doesn’t do a great job of replicating race cycling because of the body position. The upright position is instead more similar to a casual outdoor ride, and sometimes even varies from that slightly. These are also a popular in-home choice because they can often be folded away easily to save space. The upright bike is generally the cheapest type of exercise bike available. 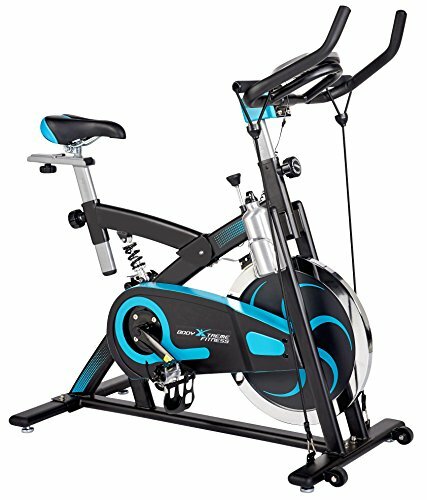 There are expensive versions too, but comparing a budget upright bike to other types, the upright is almost always going to be cheaper. If you’re interested in cheaper bikes, check out our articles of the best options under $200 and under $500. Sitting upright means aligning your spine and activating the various stabilizing muscles in your core and back. This can help to give a good overall workout and increase the number of calories burned. Many upright bikes can be folded up easily. They are also quite lightweight. These two factors make it easy to keep out of sight in a storage space, or even just tuck into the corner of a room. The Exerpeutic Folding Magnetic Upright Bike is a great example of this. Even the non-folding versions are often small and light enough to keep hidden! An upright is designed to give a good workout combined with being user-friendly. That means it doesn’t try to purely simulate road biking. One advantage of this is that uprights can use a bigger, more padded seat. They also have the handlebars and pedals in better locations. You get a lot more comfort from these features! The majority of uprights come with a console fitted. This console tracks data such as time, distance and calories burned. A standard upright console is usually more informative than the ones on spin bikes. Some uprights also offer pre-programmed workouts. Some offer a smaller variety with general goals, whilst others have a huge selection available. This can be very appealing for home users who want to keep it interesting and vary their sessions. 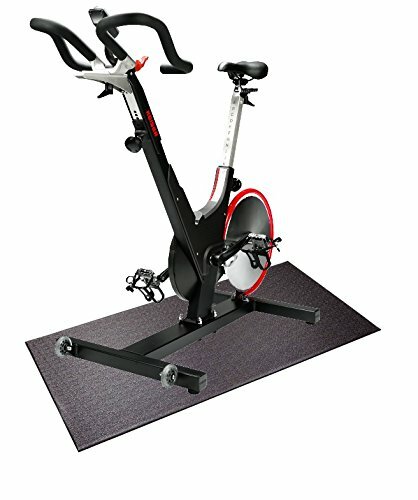 For example, the Nautilus Upright Bike comes with 22 programs, and 20 levels of resistance! Some people don’t like the upright position, especially those with lower back problems. Sitting upright for long time periods can also cause extra aches in the back, neck or forearm areas. The best way to get around this is actually try the bike before you buy, so you’re sure it aligns well for your build. Uprights tend to be lighter and not anchored as well as a recumbent or spin bike. The way force is exerted on an upright also leads it to being unstable. It’s quite a tall machine compared to other bikes yet can easily sway side to side under heavy force or fast pedalling. There’s no option for standing or hunched pedalling either because of how it’s designed. This limits how much force you can comfortably exert over an extended time anyway. The bike is unstable and not suited for heavy workouts for the reasons given. For advanced users a spin bike is definitely the better choice. Basically it all comes down to your individual needs. Are you looking for something small and easy to move, most likely for home use? Or do you prefer guided workouts and simplicity? Perhaps you’re just looking for a decent workout without paying too much, or don’t need cycling realism or heavy workouts? If you’re answering mostly yes to these, you would be best suited with an upright bike, like the Exerpeutic Magnetic Upright Bike.